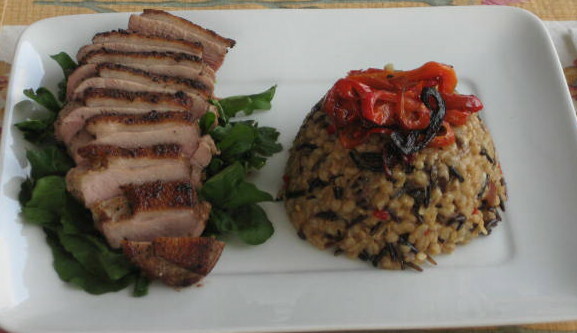 We just love duck or duck parts prepared in any way. I must have cooked well over 200 ducks and/or parts and I have learned one thing: to roast whole bird in one piece is terrible waste. While breast needs only about 15 - 20 minutes in a heavy skillet on stove top and 400°C oven, the legs on other hand need 2 hours in 350°C oven. When you do whole bird, by the time legs are done the breast is way too overcooked, dry piece of meat regardless of how much fat you leave on the bird. And there is a lot of fat. I cut up the duck into 2 breasts, 2 legs and cage and wings (video). When I roast the legs I roast the cage and wings at the same time for my duck stock. The roasted bones make incredible stock when slowly simmered with root vegetables for 2 – 3 hours. On this occasion I served the breast with my very own Three Grains Risotto. One breast will serve 2 people. 3. Do not score the skin, there are enough pores in the skin to release the fat and it also makes much better slices when done. 4. Place the duck breast skin-side down on a cold dry pan and turn on the heat (medium). 5. As the fat renders out of skin pour it out. 7. Turn the duck breast skin-side down on the pan and place it into the oven and cook for 6 minutes. Test if done. Medium rare is at 125°F at thickest part of breast. 8. Remove from oven and let the duck breast rest for about 10 - 15 minutes. 9. Slice at an angle, dot the slices with aged Balsamic Vinegar and serve on a bed of arugula. Note: The cold dry (meaning no oil) pan is important; starting on a pre-heated pan sears and locks up the fat and you end up with an overly-fatty piece of meat. This version is prepared same way as regular risotto but is much more tolerant of how often you steer it and you can keep it warm unlike Arborio risotto that has to be served immediately. Also, it is a good side dish for turkey or any wild game meat. In a separate pan heat the olive oil and butter, add the onions and garlic and stir fry very slowly for about 15 minutes without coloring. After the vegetables have softened, add all the grains and turn up the heat. When the grains start to look slightly translucent pour in the wine and let the grains absorb almost all the wine. Add 2 cups of hot stock and stir for few seconds. Cover and simmer on low heat for about 15 minutes. Check and stir every 5 minutes or so. When stock is absorbed add another cup. Repeat till all the grains are cooked to your taste. Stir in 1 T. of butter, set aside and keep warm.